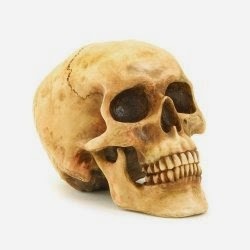 I present to you a handpicked collection of the best, scary and fun, outdoor and indoor props for Halloween. Recommended for all Halloween fanatics. These will look cool on display with all your Halloween decorations. Get ready to host an awesome Halloween party! Hauntingly creepy, life-size animated decoration. Once activated Moldy Mommy rocks her baby back and forth saying 3 eerie sayings in a really creepy voice. You can adjust the volume. Fairly life-like and the movements are excellent. Has horrifyingly realistic head and hands that look as though they are rotting and covered with mold and fungus, a fabric-wrapped moldy baby, moldy feet, tattered moldy dress and shawl. Has an easy-to-assemble metal frame, its also easy to take apart and store. The rocking chair is not included, but the figure fits - and rocks back and forth - in any chair. Very creepy, great quality Halloween decor to freak everyone out this year! A grinning, realistic skull crafted in alabastrite. The reddish tint in eyes and the base of the skull makes it looks genuinely creepy. It's all one solid piece, about half the size of an adult skull. Ideal for display on any mantel, table or shelf. Adds a spooky feel to any setting. A great decor for Halloween and theme parties. 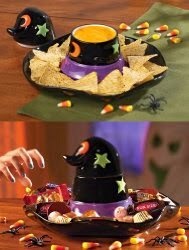 The coolest Halloween chip and dip set ever - colorful, perfect size - a delightful, fun way to serve snacks at a Halloween party. This ceramic, festive chip server has a center dip bowl with lid that removes for easy washing. It can also be the cutest Halloween candy display dish, and for the Halloween enthusiasts it can be a phenomenal decorative piece all by itself! This evil creature stands about 11 inches high, is dark green with exposed rib bones, has a snarling face with large fangs, and is sure to give the whole family nightmares! About the size of a chihuahua, the details on it are excellent. Very frightening looking, looks like it's ready to bite you. 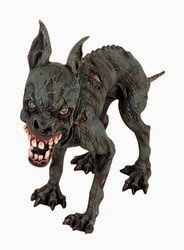 A scary zombie dog, looks scarier in person. These eerie eggs have the same milk chocolate shell you love, plus a white and green fondant center. 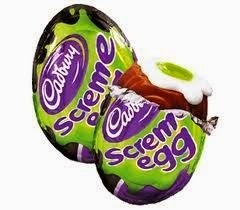 Perfect Halloween treat, they taste great. Great for sharing with friends, they are sure to be clear winners with the trick or treaters. A handcrafted terracotta zombie gnome, with a great weather-resistant paint job, it will have your friendly garden gnomes running for cover. Don't get too close! Since it is terracotta it has some weight to it and wont blow over like lighter/plastic ones. A great addition to your garden gnome collection. Have him sneaking up behind another unsuspecting gnome! Life size, realistic, ripped out eyeball, in premium acrylic - hand made and hand painted. For gore or horror fans, it does not get any better than this. This ripped out eyeball is very, very realistic, with incredible details! 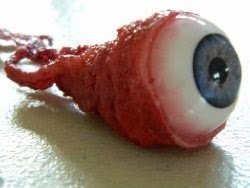 Tip: Add artificial blood slime to compliment this realistic eyeball. 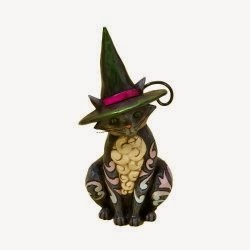 Hand crafted, hand painted, miniature cat with detailed Heartwood Creek design, and real metal tail. 3.875 inches tall, it looks awesome with its beautiful colors and intricate details. It has the appearance of being carved from a single piece of wood. A very cute halloween cat in the hat, perfect for your Halloween decorations. 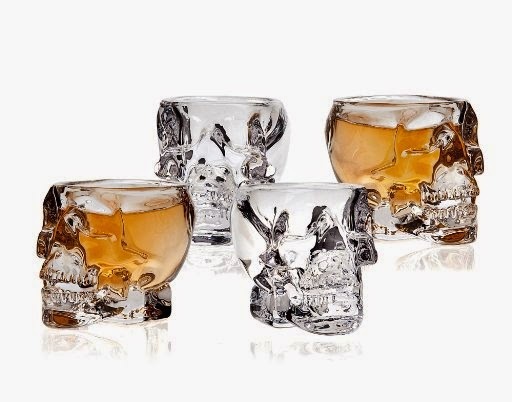 Set of four spooky 3D skull shot glasses. Made of real glass, real nice and real cool! They hold 2oz, and measure approx 3"L 2.5W" 2.5"H, more the size of rock glasses. Nice and heavy weight, sturdy and well made. Cool glasses for parties. These will be great, awesome additions to your Halloween décor! Sure shot to be big hit at Halloween party. Freak everyone out this year! Here's wishing you lots of fun with friends & family! And a fun, creepy, spooky Halloween!